It wasn’t exactly Plato’s Academy, but back in the early 70’s when I infested its halls John Marshall High School on West 140th in Cleveland was a pretty decent school—the one high school left in the once-proud Cleveland system that could match the suburban schools academically, and in fact surpass most of them. On 12 January, the Cleveland Landmarks Commission voted 5-4 to lift the building’s landmark status and pave the way for its demolition. The vote came as no surprise, though it does reveal the lack of seriousness, and the political ties of the Commission. Mayor Jackson, effectively in charge of the schools, wants it down, and so does the lowlife Council President Martin J. Sweeney, who represents the school’s neighborhood. A new building, they say, will ‘appeal to residents’. They’ve already got some architects’ drawings of the new John Marshall ready. It’s a typical low-budget shed, with the vague air of a small factory office, or a bowling alley. The politicians probably mean well. In the bovine way of Cleveland pols, they go along with whatever the functionaries of the school system want, and in a depressed city, any shiny bauble of new construction is like candy for them. The real villains here are the functionaries, the class of faceless administrators that has driven big-city school systems like Cleveland’s down into the gutter over the last forty years. 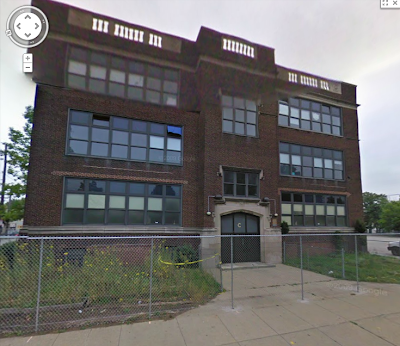 Disposing of perfectly good old schools, built with pride and built to last, has been a scandal for decades, in Cleveland and across the nation. There has always been a strong lobby for new construction in the public sphere. The state and federal governments that supply funding reinforce this prejudice; these, without exception, have always pushed for rebuilding as opposed to restoration and reuse. When school officials tell you that constructing a new building will actually be cheaper than restoring the old one, take it the same way as you do when a car salesman explains how you can’t afford not to buy the new model. Christopher Busta-Peck, who blogs at Cleveland Area History has uncovered some of the deceptions used in Cleveland: overstating the floor area of the old buildings to inflate estimates, and leaving the costs of demolition and environmental abatement out of the sticker price. They feel they have to lie, perhaps, since the vagaries of state funding rules make it so hard to get money for restoration. 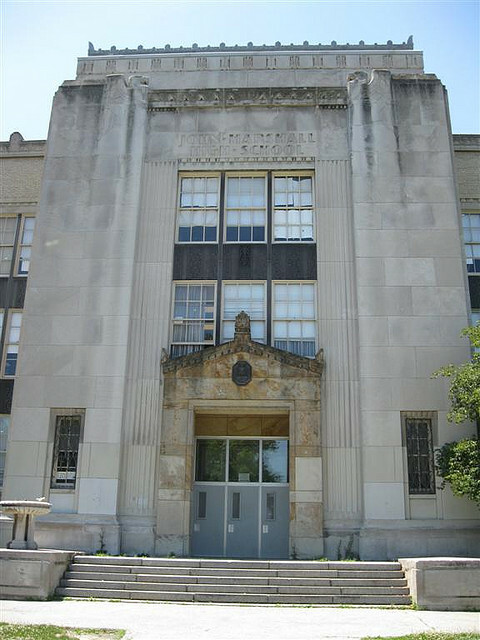 The National Trust for Historic Preservation’s report, State Policies and School Facilities recounts the obstacles to restoration placed by state rules in precise and depressing detail. Our neighbor Pennsylvania gets praise for getting rid of some of those rules, while backward Ohio is singled out for a special scolding. This is how Cleveland lost scores of treasures from its early years, such as Central High School (where Johnny Rockefeller learned to keep a ledger), Lincoln High and West High. 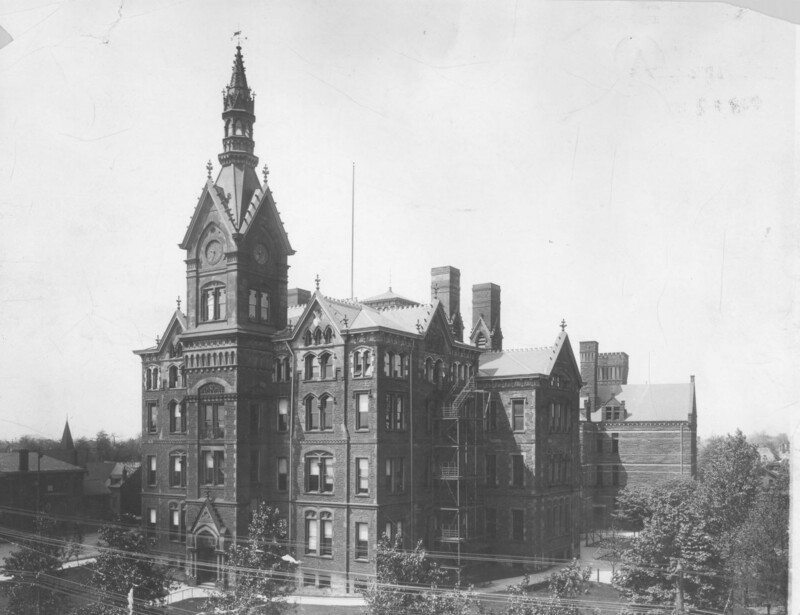 More recently, the administrators who turned Cleveland’s schools into a civic embarrassment have declared unceasing war on all the system’s older buildings. 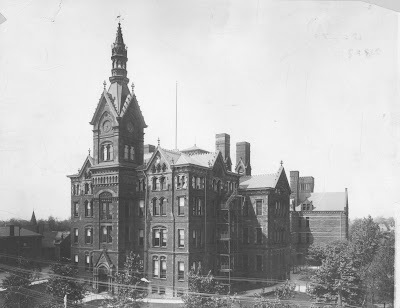 The schools Cleveland built in its Progressive era, c. 1900-1930, are something special: model schools designed in-house to the exacting standards of what was then America’s most forward-looking big-city system. This is barbarism. The brand of educated, progressive barbarism that right now is raising up yet another generation of functional illiterates has wrought havoc on the architectural heritage of the city. The streets around West 98th and Almira remain a calm, stable and agreeable working-class neighborhood, something increasingly rare in Cleveland. The school administration created this cancer in the heart of it, and you may imagine the effect it has had on the people who live there, and on outsiders’ perceptions of the neighborhood. The way they treat buildings is a mirror of the way they treat children. Almira’s students have been forced to attend Brooklawn School, a few miles away, until their new shed is built; previously they had been in Nathaniel Hawthorne, until serious deterioration was found in that building . The system planned to put some Marshall students in Brooklawn, but now they can’t. A thousand or so will be in Carl F. Shuler. This sort of surreal musical chairs has become common in Cleveland, as plans are reformulated and schools change names with each passing year. School administrations change too; one faction succeeds the other with brave talk about new beginnings. What each has had in common, over the last four decades, is monumental incompetence. As they dumbed down the curriculum, according to the fashionable theories of the day, they have reduced the system’s physical plant to ruin. The dangers found in older buildings are not natural, but in every case the result of neglected maintenance—this, in a district that has far more money to spend per pupil ($14,573, in 2009-2010) than most of its suburban neighbors. Instead of knocking down perfectly good buildings, it might be more appropriate to put the wrecking ball to the Cleveland Metropolitan School District itself, and to the entire class of self-styled educators—administrators, academics, union bosses and the whole buzzing swarm of blood-sucking ‘consultants’ and ‘experts’— that have created bureaucratic empires and enriched themselves while making the schools Cleveland’s greatest shame. Morally bankrupt and intellectually corrupt, neither they nor their empires can be reformed. Keep the buildings, keep the schools and their heritage, but tear down this system. Destroy this incorrigible symbol of failure completely and see that the people who have served it so ill never find places on the public payroll again. The sooner we do that, the sooner we can clear the ground for something fresh and green, something honest and full of promise. Wonderful Mike, you nailed it. Mike, if only you could see some of the new stuff they're throwing up, you'd be sicker still. It's cheap, it's unfriendly, it's the product of a people who need therapy.